One upon a time in a magical and colorful house, there was a group of girls creating bright happy paintings. They had tea time in the garden and learned about their God-design, one-of-a-kind uniqueness. They painted and played and laughed and they used their beautiful imaginations in full color! And for three days in the summer, they made the most amazing and the happiest paintings! 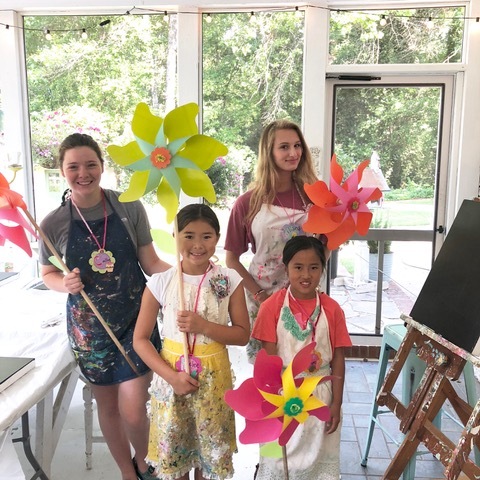 This is Art Camp 2019! 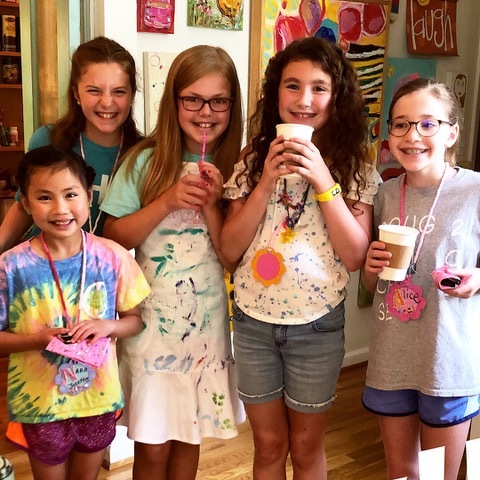 Over the past 11 years, I have loved having girls in ART CAMP! 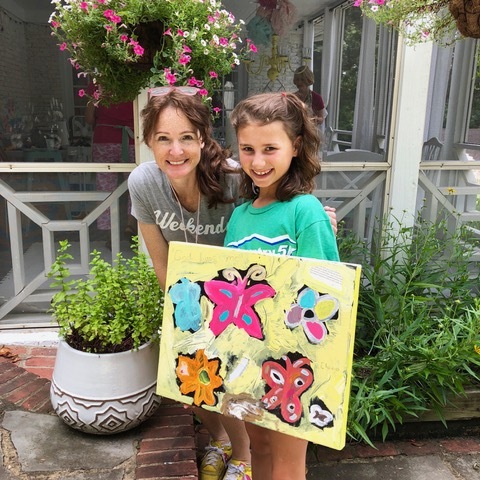 It is so much fun teaching the girls different techniques of painting in a creative and playful environment! 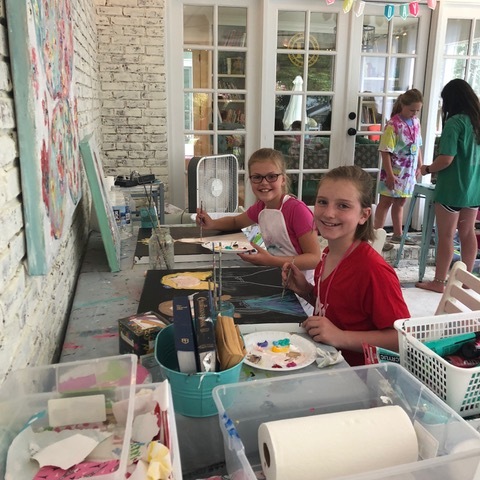 Their sweet and creative hearts shine into their paintings. And their imaginations are bright and amazing! Each camper will learn Different techniques in painting with acrylics. 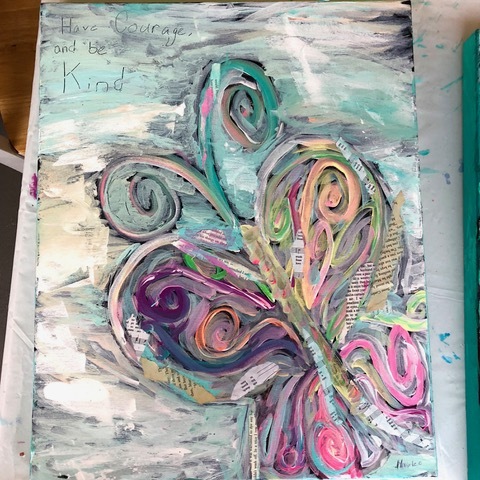 each camper will Learn about Mixed MEdia PAinting and using a Variety of paper in their paintings. 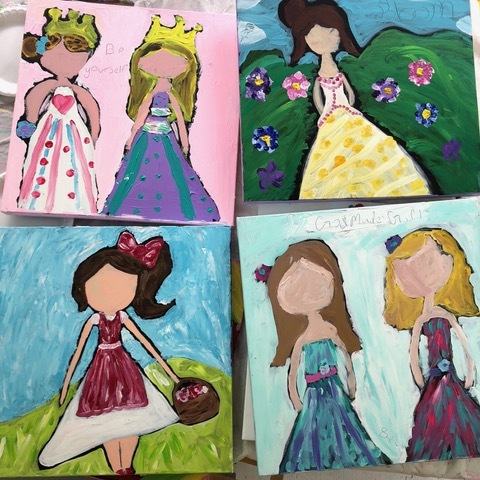 EAch Camper will take home 3 beautiful paintings! 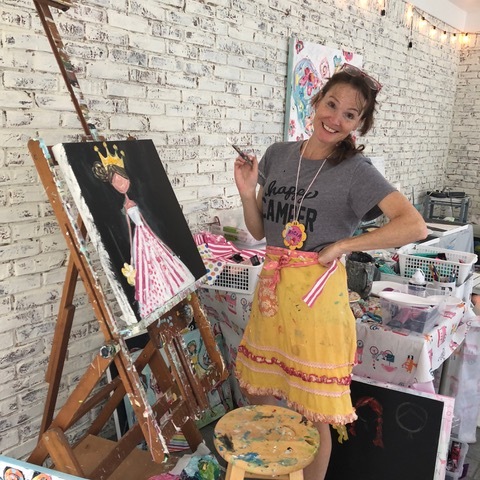 I love to teach painting in a way that is playful and happy because that is how I feel painting should be—PLAYFUL and HAPPY! I also share about painting "wonky"! My definition for “ wonky” is “the beautiful imperfect” and painting “wonky” is being free to make "mistakes”. And those "mistakes" add to your unique style. In painting techniques, I’ll show the campers how to use different brushes and palette knives. I’ll also show them how to paint with acrylic paint and use mixed media techniques with paper. The paper is so much fun and the girls always love this part! They become a “designer” and make the most beautiful dress designs and flowers with paper and paint! I encourage campers to play and have fun with the process. I always emphasize the “beautiful imperfect” and to not focus on perfection and trying to make the dress perfect or the flowers perfect, but just add the wonky! Making the flower oversized and flopsy and lopsided gives more freedom! And it's magical when I say "paint wonky”. Because the paintings are more joyful! There is more laughter and less tedious painting and wondering "Am I doing it right?" And the atmosphere is much more fun when the emphasis is on painting wonky! I also have devotions in the morning with the girls and we talk about their God given uniqueness and creativity! I share my favorite quotes and verses that inspire me in my own painting life. They get a sneak peek into "the life of an artist"! I also love using Zephaniah 3:17 "For the Lord your God is with you, He is mighty to save. He will take great delight in you. He will quiet you with His love. He will rejoice over you with singing." And my prayer is that each camper will understand more about delight and how God delights in them! 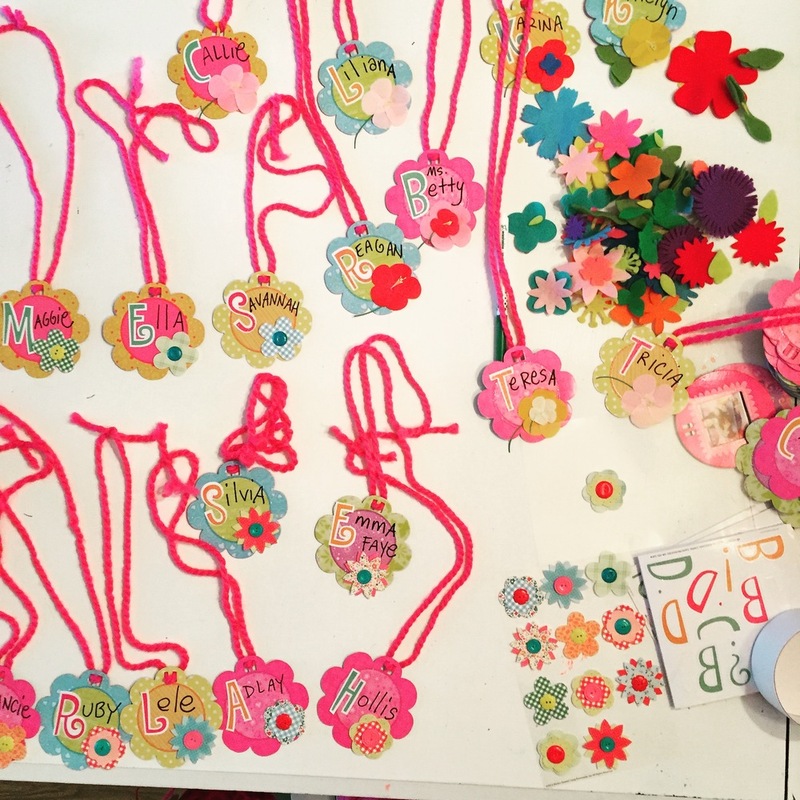 For this SUMMER 2019, I have many sparkly ideas to put into action for Girl's ART CAMP! YIPPEE! It's going to be filled with creativity buzzing and happiness, sunshine plus lots of paint and color and FUN! I would love for your daughters to join me for this 2019 camp! to know that God is dwelling in our midst. His LOVE and Kindness is over us! fun and PLAY and Freedom in the Creation and painting process! Camp is at my home just outside Birmingham, Alabama. 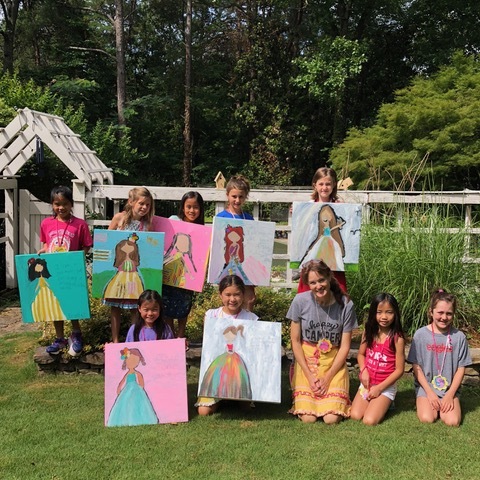 Girl’s Art Camp is June 10-12 (2 sessions).